Cocoon Corporate provides unique and original corporate business gifts, hampers and goody bags for business, conference delegates, staff or clients, exhibitions, corporate events and pretty much any other occasion. They have a huge range from the cheerful to the highest premium brands, uniquely tailoring contents to fit your brief and budget exactly. They came to Seventy9 with the objective of completely overhauling their online presence. 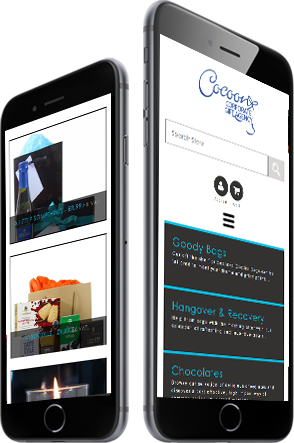 We were asked to design a full eCommerce, mobile responsive, CMS-driven website, showcasing the customisation element of Cocoon's corporate gift baskets, with the user journey needing to be concise, informative and user friendly. The ability for a customer to easily navigate, select and ultimately purchase from such a vast range of products was paramount. The website would be led with a focus on product imagery, together with a reduction in text, while introducing a more balanced look and feel with a friendlier tone of voice. With such a massive product range across the Cocoon Corporate eCommerce site, we developed a clean, impactful, fully responsive website with all products clearly and beautifully legible, showcasing the entire range, with an easy route from selection to checkout, available on any size of device. We developed a 'Create Your Own' option, allowing customers to mail a brief via an online form maintaining Cocoon's USP as the ability to combine a variety of unique items together in branded packaging to create very high impact options. And, unlike other competitor sites, we maintained the provision of truly original choices, allowing the customer to tailor contents to suit their clients, employees or audience, while sourcing from thousands of easily navigable products and categories. Our design team went through an extensive concept design stage with the team from Cocoon. Working in partnership we formulated a creative draft we were all happy with. A design that would provide the end user client with a much better shopping experience. The project went to development and using our internally designed backend development platform, we delivered a customisable shopping cart experience allowing Cocoon's clients the ability to edit gift hampers to their specific requirements.